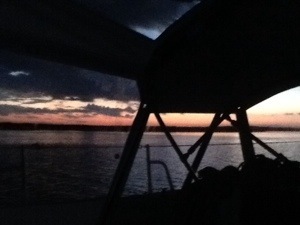 We left Grande Dunes this morning around 0730 with the intent of heading to Georgetown, but with a forecast for moderate winds and a limited anchorage area we kept on going and anchored in (supposedly) alligator infested waters at South Santee River. So here we sit in the cockpit watching the sunset. So far it is nice and quiet, but the Mosquitos found us before we got the cockpit enclosed. An early start should get us to Charleston in time for lunch. Today was mostly winding along the Waccamaw River with plenty of depth and few bridges. A sharp contrast to all the stress of yesterday. We did hit a crab float but no damage.